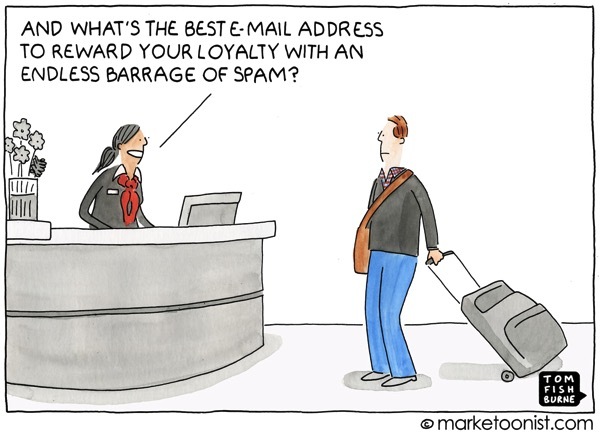 Reward My Loyalty … with Spam! How many times have you purchased something on line, or even just expressed a bit of interest in a new product, and are immediately hit with a seemingly endless series of marketing emails? Identity as a Business Enabler – A New Concept? Sometimes, I get impatient with the pace of progress in the Identity industry in general and certain companies in particular. Yesterday, I listened to a presentation where the speaker was extolling the virtues of thinking of Identity and Access Management as an enabler for Digital Transformation, not just a defensive protector of data and systems. He spoke as if this were a startling new concept. Viewing Identity Management as a business enabler rather than just a cost-reduction vehicle or compliance assistant allows us to think beyond the constraints of how we do business now. Just think of how many more customers you could serve, how many more services you could deliver and how many more partner relationships you could leverage if you knew that identities of all participants were highly secure but highly connectable! Identity is an essential, core enabler of online business. Identity must not be an afterthought, a necessary evil, or a function forced by government regulation. It is more properly recognized as a key business enabler. The modern business paradigm of delivering highly personalized service to individual consumers demands that Identity is at the core of the business process. It is a concept that is still valid today. I’m glad to see more folks are catching on. 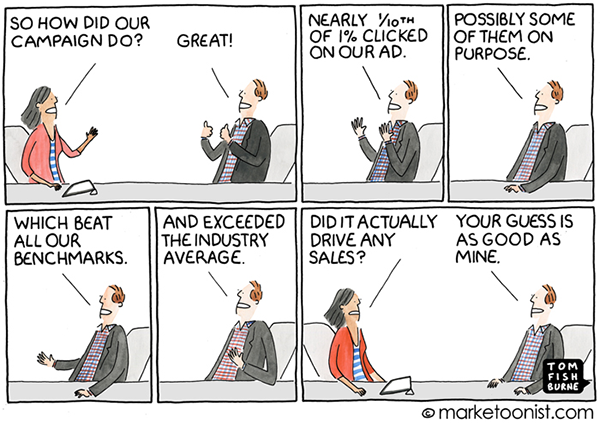 Aw, the firm predictability of click-throughs to revenue! Thanks to Tom Fishbone, the Marketoonist, for this wry wisdom. Digital Business – Do We Have the Right Buzzwords? Today at the Gartner IAM Summit today I heard the term “Digital Business” dozens of times. Do you think we have the right collections of buzzwords to describe that trend? Thanks to the Marketoonist for the insightful drawing! What in the world is Digital Transformation? The more I read about and discuss the hot buzzword “Digital Transformation,” the more I think of the old “Blind Men and the Elephant” story. Each blind man’s perception of reality was different, depending on which part of the elephant’s anatomy he examined. The meaning of Digital Transformation also seems to depend highly on who is thinking about the subject. To the business leader who has the vision of leveraging a company’s vast data resources to open new revenue opportunities through selling access to that data to interested customers, Digital Transformation is all about rapidly delivering that digital asset (data) to customers in new, innovative ways. To the leader who is primarily interested in customer acquisition and loyalty in a consumer goods market, Digital Transformation may include “store of the future” concepts and providing a omni-channel customer buying experience. To the health care executive, Digital Transformation may include providing electronic health records for patients that span multiple care providers to provide a more seamless and effective experience for patients and more profitable revenue channels for the many enterprises involved. I’m sure thou can think of many more business examples. 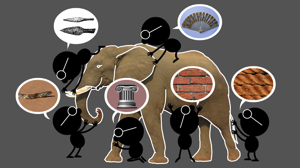 There are lots of body parts to the Digital Transformation elephant. Each of the viewpoints above is somewhat correct, but is lacking in completeness. 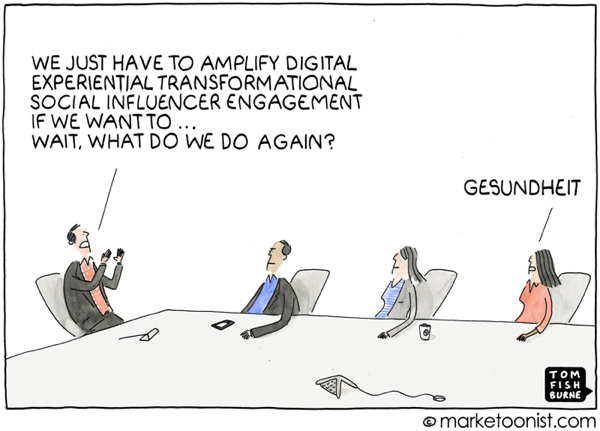 Digital Transformation is a big subject. Digital Transformation involves dramatically changing the enterprise to embrace and leverage digital technology to compete in new, innovative and disruptive ways. From the technology viewpoint, we must remember that technology must enable business, not just exist for the sheer beauty of new stuff. Many technologies are converging to enable Digital Transformation – Mobile, Social, Cloud, Big Data, Internet of Things, APIs – I have probably missed a few. Any or all of these technologies can be leveraged in a Digital Transformation, depending on what is needed to support the business. No single technology is sufficient. Digital startups sit inside your organization, in your marketing department, in HR, in logistics and in sales. As IT leaders, you must design, resource and deploy for a world that’s digital first. In this new model, every business unit is a technology startup. Now is your opportunity to create that team. Partner with the digital startups inside your organization and prove that you can move fast too. Embrace the outside change. Digital transformation is the process of shifting your organisation from a legacy approach to new ways of working and thinking using digital, social, mobile and emerging technologies. It involves a change in leadership, different thinking, the encouragement of innovation and new business models, incorporating digitisation of assets and an increased use of technology to improve the experience of your organisation’s employees, customers, suppliers, partners and stakeholders. 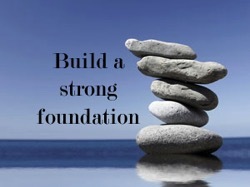 Excellent firms don’t believe in excellence – only in constant improvement and constant change. That is, excellent firms of tomorrow will cherish impermanence and thrive on chaos! A word of warning, however. Several years ago, when “Business Process Re-engineering” was a popular buzzword, a friend of mine was really excited when he was first assigned to a re-engineering team in his company. He was not so happy a while later when he hold me his position in the company was re-engineered. He had been laid off! We must be agile ourselves to survive and thrive! 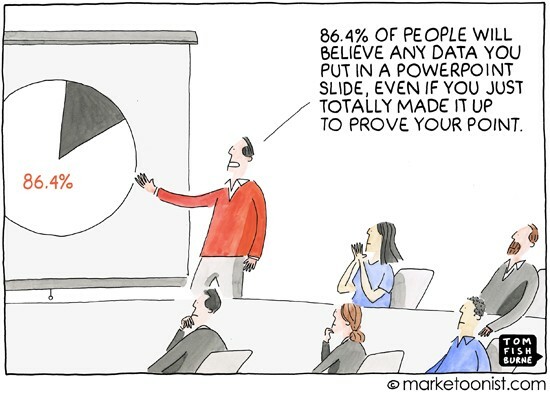 How many PowerPoint slides have you presented? How many statistics have you used (or abused)? 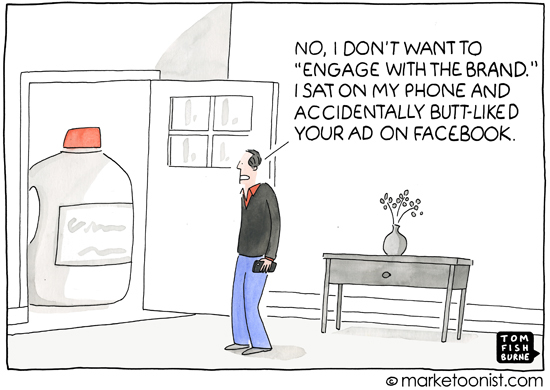 No, I don’t want to engage! Do you ever wonder why in the world you receive the ads you do on Facebook or other online venues? Methinks personalized, targeted advertising still has a long way to go. It was 100 years ago today that the Computing Tabulating Recording Corporation was incorporated through a merger of four companies: the Tabulating Machine Company, the International Time Recording Company, the Computing Scale Corporation, and the Bundy Manufacturing Company. It’s name was later changed to International Business Machines Corporation. 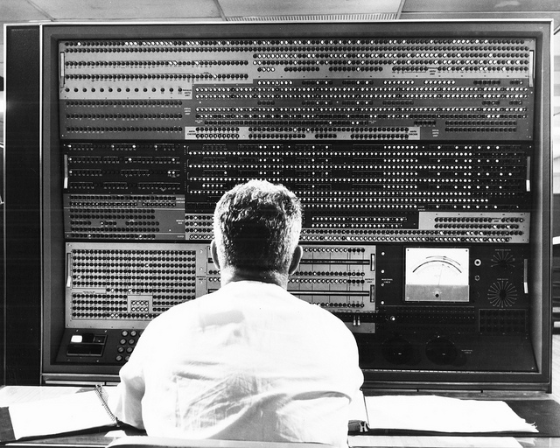 Today we salute IBM for its innovation and endurance, its ability to remake itself time after time, and for leading the way to the era of modern computing which we now enjoy. I love old photos of the big panels with so many flashing lights. And that guy probably knows what each of those lights means! Have you ever thought what Dilbert and Alice are saying in this comic strip? Don’t lie, now. We could all work on being a bit more punctual for meetings and con calls, don’t you think? Business Continuity as a Service? My cyberspace friend André Koot recently translated his provocative blog post, entitled “Continuity as a Service,” from Dutch to English. If you are interested in cloud computing, I highly recommend that you take time to read the article. The cloud reminds me of that old Blob, the science fiction movie, cloud is becoming so pervasive that it seems to take control of everything. And just admit it, we find that exciting, scary and fun at the same time. But if everything disappears in the fog, how do we know that business is as usual? Most risks are well known. Using standard operating procedures, access control and audits we can identify and mitigate problems relatively easy. And already there is a lot of information about security in the cloud. But one area of risk is not yet completely clear, the risks of business continuity. Although new legal relationships are essential, they certainly don’t solve everything. But the core of the AAS problem is that contract partners are not always the parties who offers the actual service. You can try to mitigate risks in contracts, but the fact of the matter is that you want to move to the cloud, because of the positive price / performance ratio of multi-tenancy and the (re) use of standard applications. Long term subcontractor relations in the real world don’t exits in the Cloud. If one platform provider is too expensive, our service provider just moves to another. This means that we are victims of the arbitrariness of our providers. What happens if the SAAS provider goes away? Is “Cloud Escrow as a Service” a valid concept? What happens if the PAAS provider underneath the SAAS provider goes away? What measures should you take now so you can endure a cloud failure? The uncertainty surrounding continuity is high at this moment. The question is whether for business-critical applications sensible solutions in the cloud exist today. An assessment around the continuity and security risks and safeguards in place seems to be appropriate. Amazon’s recent challenges certainly focused our collective attention on this important subject. In order for the challenges related to business continuity in cloud computing to be solved, there is much work to be done. 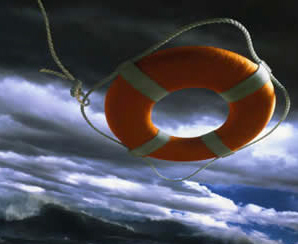 By the way, I thought the photo of a life preserver in the clouds was very appropriate for this post. It came from a blog post about business continuity by Maurice Saluan, VP-Channel Management for Zenith Infotech, a company heavily involved in cloud computing and business continuity.